This is one of 3 LoZ boxes I've made. All 3 of them are now gone. I haven't used a stencil, they're all done by hand. A Chu chu from LoZ, I'm still in 2 minds onto whether I should make any others at the moment, though I loved making this little guy! This is my fluffy chocobo I made last year, he took forever! He's currently sat on the fireplace. Smeargle with it's own mini canvas. I was really pleased with how this turned out, seeing as his feet didn't want to keep him up at one point! This took me about 6 hours to do, I ran out of green beads twice and almost knocked it off the table I was working on at the time! This is now hanging up at my friends place. I was so happy with how this Link turned out, especially his shield! I was going to make him little bombs and stuff but it was too fiddly in the end. This is my little LoZ Ocarina of Time kit I made. The Navi had a bell inside it that rang when you shook her. She was so much fun to make, my friend really wanted me to make her for him. Still haven't got round to make Latios though! One of my best friends asked for this little Deino, I was so pleased with how he finally turned out, since his neck kept snapping off. I can't quite remember how I managed to keep it on in the end. I know it doesn't look like much at the moment. I need to go over the tree trunks again, and the items need to be a bit more detailed. The leaves themselves are going to be made from felt and glued onto the box, which I'm in the process of doing. I've also included the Cheshire cat in the lid, so when you open it up, all you can see is his face grinning at you. Hopefully at the end this Alice in Wonderland box will look great once I've finished it. All figurines are made of something called "air dough". It moulds like play doh but dries hard, yet still really light. It's my favourite material to use. I've tried using normal air drying clay before, but I find that I can't get the same results, and the items at the end are nowhere near as good quality at the end. I also use acrylic paint when I'm painting, I find the colours come out a lot brighter than oils or watercolours. So... Any criticism would be accepted. I spend hours of my free time on this stuff. Also, if you want me to make something, just let me know. These are really great, very cool to see! OrangeRakoon wrote: These are really great, very cool to see! Is it just me or is this really suggestive? But yeah, I definitely agree these are really cool. I can see why you say these take a long time! These are awesome, especially the ChuChu, Zelda&Hylia and the Green Green Kirby pic. Keep uploading! I'll upload when I've updated the stuff I'm making... I've been busy lately being social for once so once I'm back to working on my stuff I'll defo update this. And I'm currently working on this one, hence why I need a soldering iron. The work has moved on since this was taken. The Chandelure has been painted and the box has purple flames coming up the sides of the box. I have yellow LEDs in the eye holes and purple ones on each flame with three on it's head. The switch is on the side of the lid and I have the clip to put inside, I literally just need to solder the circuit together to get this working and complete! The Unga Bunga crate and ? box are great - what are you using them for? I'm probably going to try to sell them later on in the year. I just paint them for the fun of it all really, I don't do much with them once they're completed seeing as I don't have much room to display them. 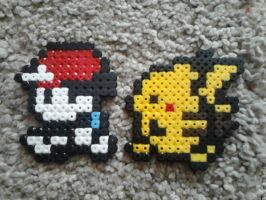 I want to do more like those two but unfortunately I can't find any of those mini crates anywhere now, I only have the one left and I can't seem to decide whether to make it into another crash crate, a mario one or something from a different game.